What Exactly Is Intermodal Competition? Focus on 4 words: same, different, identical, same. Same is repeated twice. The Free State Foundation (FSF) is out with a paper regarding the existence of intermodal competition between wireless and wired. The reason is that they take exception with the FCC’s recent reports on Wireless and Video competition. 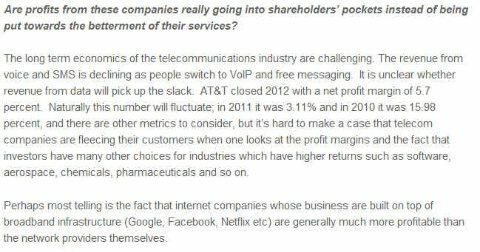 Saying wireless represents intermodal competition to wired (fiber/coax) is like saying that books compete with magazines or radio competes with TV. Sure, the former both deliver the printed word. And the latter both pass for entertainment broadcast to us. Right? Yet these are fundamentally different applications and business models even if they may share common network layers and components, or in English, similarities exist between production and distribution and consumption. But their business models are all different. So are wireless and wired really the SAME? For voice they certainly aren’t. Wireless is still best efforts. It has the advantage of being mobile and with us all the time, which is a value-added, while wired offers much, much better quality. For data the differences are more subtle. With wireless I can only consume stuff in bite sizes (email, twitter, peruse content, etc..) because of throughput and device limitations (screen, processor, memory). I certainly can’t multi-task and produce content the way I can on a PC linked to a high-speed broadband connection. That said, increasingly people are using their smartphones as hotspots or repeaters to which they connect their notebooks and tablets and can then multi-task. I do this a fair bit and it is good while I'm on the road and mobile, but certainly no substitute for a fixed wired connection/hotspot in terms of speed and latency. Furthermore, wireless carriers by virtue of their inefficient vertically integrated, siloed business models and the fact that wireless is both shared and reused, have implemented onerous price caps that limit total (stock) consumption even as the increase speed (flow). The latter creates a crowding out effect and throughput is degraded as more people access the same radio, which I run into a lot. I know this because my speed decreases or the 4G bars mysteriously disappear on my handset and indicate 3G instead. Lastly, one thing I can do with the phone that I can’t do with the PC is take pictures and video. So they really ARE different. And when it comes to video, there is as much comparison between the two as a tractor trailer and a motorcycle. Both will get us there, but really everything else is different. At the end of the day, where the two are similar or related is when I say wireless is just a preferred access modality and extension of wired (both fixed and mobile) leading to the law of wireless gravity: a wireless bit will seek out fiber as quickly and cheaply as possible. And this will happen once we move to horizontal business models and service providers are incented to figure out the cheapest way to get a bit anywhere and everywhere. By saying that intermodal competition exists between wireless and wired, FSF is selectively taking aspects of the production, distribution and consumption of content, information and communications and conjuring up similarities that exist. But they are really separate pieces of the of the bigger picture puzzle. I can almost cobble together a solution that is similar vis a vis the other, but it is still NOT the SAME for final demand! This claiming to be one thing while being another has led to product bundling and on-net pricing--huge issues that policymakers and academics have ignored--that have promoted monopolies and limited competition. In the process of both, consumers have been left with overpriced, over-stuffed, unwieldy and poorly performing solutions. In the words of Blevins, FSF is once again providing a “vague, conflicting, and even incoherent definition of intermodal competition.” 10 years ago the US seriously jumped off the competitive bandwagon after believing in the nonsense that FSF continues to espouse. As a result, bandwidth pricing in the middle and last mile disconnected from moore’s and metcalfe’s laws and is now overpriced 20-150x impeding generative ecosystems and overall economic growth. DrPeering Really Thinks Cellphones Are, Well, Awful! The Wireless wave beginning in the early 1990s and was a direct outgrowth of the latter two. Digital cellphones were based on the same technology as the PCs that were exploding with internet usage. Likewise, super-low-cost WAN pricing paved the way for one-rate, national pricing plans. Prices dropped from $0.50-$1.00 to less than $0.10. Back in 1996 we correctly modeled this trend before it happened. Each wave may have looked different, but they followed the same patterns, building on each other. As unit prices dropped 99%+ over a 10 year period unit demand exploded resulting in 5-25% total market growth. In other words, as ARPu dropped ARPU rose; u vs U, units vs Users. Elasticity. Yet with each new wave, people remained unconvinced about demand elasticity. They were just incapable of pivoting from the current view and extrapolating to a whole new demand paradigm. Without fail demand exploded each time coming from 3 broad areas: private to public shift, normal price elasticity, and application elasticity. Private to Public Demand Capture. Monopolies are all about average costs and consumption, with little regard for the margin. As a result, they lose the high-volume customer who can develop their own private solution. This loss diminishes scale economies of those who remain on the public, shared network raising average costs; the network effect in reverse. Introducing digitization and competition drops prices and brings back not all, but a significant number of these private users. Examples we can point to are private data and voice networks, private radio networks, private computer systems, etc…that all came back on the public networks in the 1980s and 1990s. Incumbents can’t think marginally. Normal Price Elasticity. As prices drop, people will use more. It gets to the point where they forget how much it costs, since the relative value is so great. One thing to keep in mind is that lazy companies can rely too much on price and “all-you-can-eat” plans without regard for the real marginal price to marginal cost spread. The correct approach requires the right mix of pricing, packaging and marketing so that all customers at the margin feel they are deriving much more value than what they are paying for; thus generating the highest margins. Apple is a perfect example of this. Sprint’s famous “Dime” program was an example of this. The failure of AYCE wireless data plans has led wireless carriers to implement arbitrary pricing caps, leading to new problems. Incumbents are lazy. Application Elasticity. The largest and least definable component of demand is the new ways of using the lower cost product that 3rd parties drive into the ecosystem. They are the ones that drive true usage via ease of use and better user interfaces. Arguably they ultimately account for 50% of the new demand, with the latter 2 at 25% each. With each wave there has always been a large crowd of value-added resellers and application developers that one can point to that more effectively ferret out new areas of demand. Incumbents move slowly. Demand generated via these 3 mechanisms soaked up excess supply from the digital tsunamis. In each case competitive pricing was arrived at ex ante by new entrants developing new marginal cost models by iterating future supply/demand scenarios. It is this ex ante competitive guess, that so confounds the rest of the market both ahead and after the event. That's why few people recognize that these 3 historical waves are early warning signs for the final big one. The 4th and final wave of digitization will occur in the mid-to-last mile broadband markets. But many remain skeptical of what the "demand drivers" will be. 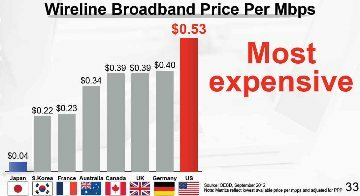 These last mile broadband markets are monopoly/duopoly controlled and have not yet realized price declines per unit that we’ve seen in the prior waves. Jim Crowe of Level3 recently penned a piece in Forbes that speaks to this market failure. In coming posts we will illustrate where we think bandwidth pricing is headed, as people remain unconvinced about elasticity, just as before. 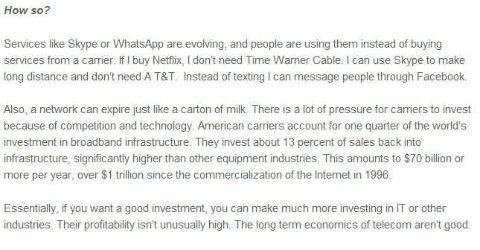 But hopefully the market has learned from the prior 3 waves and will understand or believe in demand forecasts if someone comes along and says last mile unit bandwidth pricing is dropping 99%. Because it will. Is the Wireless Ship of State "Synching"? Wireless service providers (WSPs) like AT&T and Verizon are battleships, not carriers. Indefatigable...and steaming their way to disaster even as the nature of combat around them changes. If over the top (OTT) missiles from voice and messaging application providers started fires on their superstructures and WiFi offload torpedoes from alternative carriers and enterprises opened cracks in their hulls, then Dropbox bombs are about to score direct hits near their water lines. The WSPs may well sink from new combatants coming out of nowhere with excellent synching and other novel end-user enablement solutions even as pundits like Tomi Ahonen and others trumpet their glorious future. Full steam ahead. Instead, WSP captains should shout “all engines stop” and rethink their vertical integration strategies to save their ships. A good start might be to look where smart VC money is focusing and figure out how they are outfitted at each level to defend against or incorporate offensively these rapidly developing new weapons. More broadly WSPs should revisit the WinTel wars, which are eerily identical to the smartphone ecosystem battles, and see what steps IBM took to save its sinking ship in the early 1990s. One unfortunate condition might be that the fleet of battleships are now so widely disconnected that none have a chance to survive. The bulls on Dropbox (see the pros and cons behind the story) suggest that increased reliance on cloud storage and synching will diminish reliance on any one device, operating system or network. This is the type of horizontalization we believe will continue to scale and undermine the (perceived) strength of vertical integration at every layer (upper, middle and lower). Extending the sea battle analogy, horizontalization broadens the theatre of opportunity and threat away from the ship itself; exactly what aircraft carriers did for naval warfare. Synching will allow everyone to manage and tailor their “states”, developing greater demand opportunity; something I pointed out a couple of months ago. People’s states could be defined a couple of ways, beginning with work, family, leisure/social across time and distance and extending to specific communities of (economic) interest. I first started talking about the “value of state” as Chief Strategist at Multex just as it was being sold to Reuters. Back then I defined state as information (open applications, communication threads, etc...) resident on a decision maker’s desktop at any point in time that could be retrieved later. Say I have multiple industries that I cover and I am researching biotech in the morning and make a call to someone with a question. Hours later, after lunch meetings, I am working on chemicals when I get a call back with the answer. What’s the value of bringing me back automatically to the prior biotech state so I can better and more immediately incorporate and act on the answer? Quite large. Fast forward nearly 10 years and people are connected 7x24 and checking their wireless devices on average 150x/day. How many different states are they in during the day? 5, 10, 15, 20? The application world is just beginning to figure this out. Google, Facebook, Pinterest and others are developing data engines that facilitate “free access” to content and information paid for by centralized procurement; aka advertising. Synching across “states” will provide even greater opportunity to tailor messages and products to consumers. Inevitably those producers (advertisers) will begin to require guaranteed QoS and availability levels to ensure a good consumer experience. Moreover, because of social media and BYOD companies today are looking at their employees the same way they are looking at their consumers. The overall battlefield begins to resemble the 800 and VPN wars of the 1990s when we had a vibrant competitive service provider market before its death at the hands of the 1996 Telecom Act (read this critique and another that questions the Bell's unnatural monopoly). Selling open, low-cost, widely available connectivity bandwidth into this advertising battlefield can give WSPs profit on every transaction/bullet/bit across their network. That is the new “ship of state” and taking the battle elsewhere. Some call this dumb pipes; I call this a smart strategy to survive being sunk. The sports world is a great place to test and prove out management tactics and strategies. Unlike in the commercial world where reasons for and measurement of product success are highly variable and of uncertain duration, sports leagues provide tightly controlled competitive conditions that enable consistent quantitative comparisons. As a result, one can clearly see winning strategies and tactics based on season over season performance. None is more remarkable than Sir Alex Ferguson’s record at Manchester United, probably the best record of any team/coach at the top leagues in any sport over the past 2+ decades. Others have written about his management style here and here. A great leader is one who gets the best from himself, his employees and customers regardless of the situation or context, be they sports teams, armies, corporations, academic institutions, societies, etc... SAF's record is more remarkable in that it has improved the game of soccer at the same time. Ultimately everyone is subservient and bound by the objective of the team, including himself. SAF's style is best described as a disciplined command and control approach that leads to employee empowerment. SAF has grown, bought, developed, and nurtured superstars and when they've outgrown the team, they are gone. 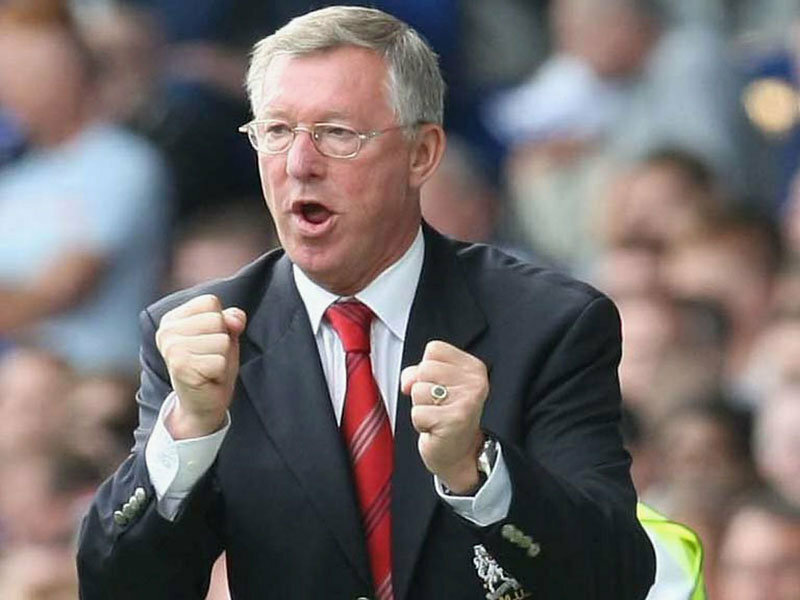 In his own words SAF says detail is important. He is probably an acolyte of Edward Tufte, who says more information is better. Through analytics SAF looks to gain the proverbial inch to give him the advantage over other teams. In the process his staff has increased from 8 to 30 people over the past 2 decades. In order to synthesize the information and implement strategy leading to individual decision making SAF has implemented an organizational matrix approach and not a management pyramid (or inverted one for that matter). 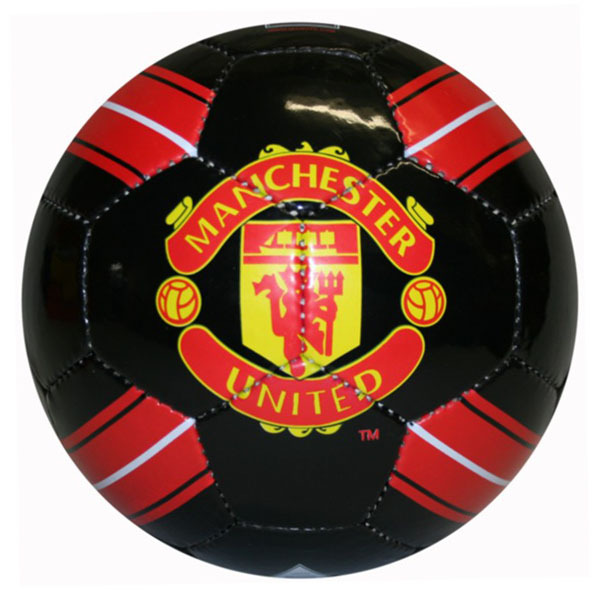 The result is that on game day ManU teams are capable of making decisions on the field and have the resolve to come from behind more often than not. So how did SAF manage this? As a soccer purist, I love the style of play that is uptempo and attacking. As a former defender I love when ManU’s right or left defenders become 3rd and 4th attackers up the wings. But at the same time, striking the correct balance offensively and defensively is key. By establishing a matrix approach SAF made it easier to move players around between and during games and to identify and increase their value relative to other players around them, so that a weakness in one area can be countered with strength in another. Furthermore, the matrix approach empowers weak players and makes superstars out of "ordinary" players like Ryan Giggs and Paul Scholes; whom many would never have guessed to have such an impact on the team, or the game, as individuals. In a matrix, employees have a 3D view of their decisions and the impact on the rest of the organization (resource constraints/availability). From a tactical perspective (micro level) it enables forwards to play midfield and help on defense and defenders to develop the attack and even score. A good example is a player like Valencia who used to just be a wing at another team, but has become a very dangerous midfielder and at times has started at right-back for an injury-riddled defense this season. 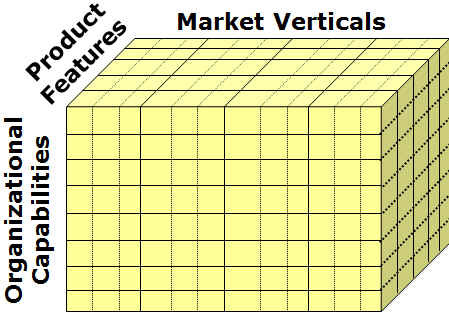 Strategically (at a macro level), the matrix defines key technology/product (supply) and customer/market (demand) parameters. With a matrix approach micro and macro perspectives can be easily related. For instance, SAF would never have let an individual player take over an entire organization’s public perception as Luis Suarez has at Liverpool this season. Because of the matrix SAF’s strongest player is often the one others' consider weakest. Rather than focusing on his superstars, he focuses on getting the superstars to work with the weakest players and vice versa. Bringing this closer to home and more timely, the New York Knicks should implement a matrix approach both at the management/organizational and team levels. Just look at the benefit the team gets from a player considered weak, Jeremy Lin, but who passes the ball effectively to very talented players versus superstars like Carmelo Anthony or Baron Davis who have a hard time being “matrix” players. Every organization should develop its matrix and understand how employees play together as a team and how the organization is positioned in competitive industries. Welcome M. Zipf, Meet M. Moore et M. Metcalfe. Enchant�! You all know Monsieurs (MM.) Moore et Metcalfe. But do you know Monsieur (M.) Zipf? I made his acquaintance whilst researching infinite long tails. Why does he matter, you inquire? Because M. Zipf brings some respectability to Moore et Metcalfe, who can get a little out of control from time to time. Monsieur Moore is an aggressive chap who doubles his strength every 18 months or so and isn’t shy about it. Monsieur Metcalfe has an insatiable appetite, and every bit he consumes increases his girth substantially. Many people have made lots of money from MM Moore’s et Metcalfe’s antics over the past 30 years. The first we refer to generally as the silicon or processing effect, the latter as the network effect. Putting the two together should lead to declines of 50-60% in cost for like performance or throughput. Heady, rather piggish stuff! Monsieur Zipf, on the other hand, isn’t one for excess. He follows a rather strict regimen; one that applies universally to almost everything around us; be it man-made or natural. M. Zipf isn’t popular because he is rather unsocial. He ensures that what one person has, the next chap only can have half as much, and the next chap half that, and so on. It’s a decreasing, undemocratic principle. Or is it? Despite his unpopularity, lack of obvious charm and people’s general ignorance of him, M. Zipf’s stature is about to rise. Why? Because of the smartphone and everyone’s desire to always be on and connected; things MM Moore and Metcalfe wholeheartedly support. M. Zipf is related to the family of power law distributions. Over the past 20 years, technologists have applied his law to understanding network traffic. In a time of plenty, like the past 20 years, M. Zipf’s not been that important. But after 15 years of consolidation and relative underinvestment we are seeing demand outstrip supply and scarcity is looming. M. Zipf can help deal with that scarcity. 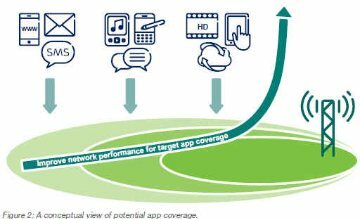 Capacity will only get worse as LTE (4G) devices explode on the scene in 2012, not only because of improved coverage, better handsets, improved Android (ICS), but mostly because of the iconic iPhone 5 coming this summer! Here’s the thing with 4G phones, they have bigger screens and they load stuff 5-10x faster. So what took 30 seconds now takes 3-10 seconds to load and stuff will look 2-3x better! People will get more and want more; much to MM Moore’s et Metcalfe’s great pleasure. “Un moment!” cries M. Zipf. “My users already skew access quite a bit and this will just make matters worse! Today, 50% of capacity is used by 1% of my users. The next 9% use 40% and the remaining 90% of users use just 10% of capacity. With 4G the inequality can only get worse. Indignez-vous! Which is the latest French outcry for equality.” It turns out Zipf's law is actually democratic in that each person consumes at their marginal not average rate. The latter is socialism. Few of us will see this distribution of usage as a problem short-term, except when we’re on overloaded cellsites and out of reach of a friendly WiFi hotspot. The carriers will throw more capex at the problem and continue to price inefficiently and ineffectively. The larger problem will become apparent within 2 years when the 90% become the 10% and the carriers tell Wall Street they need to invest another $50B after 2015 just after spending $53B between 2010-2014. Most people aware of this problem say there is a solution. More Spectrum = more Bandwidth to satisfy MM Moore et Metcalfe. But they’ve never heard of M. Zipf nor understood fully how networks are used. Our solution, extended as a courtesy by M. Zipf, is to “understand the customer” and work on “traffic offloading” at the margin. Pricing strategies, some clever code, and marketing are the tools to implement a strategy that can minimize the capital outlays, and rapidly amortize investment and generate positive ROI. We’ve been thinking about this since 1996 when we first introduced our 4Cs of Wireless (cost, coverage, capacity and clarity) analyzing, understanding and embracing 10 cent wireless pricing (introduced by French Canada's revolutionary MicroCell). As a result we were 2-3 years ahead of everybody with respect to penetration, consumption and wireline substitution thinking and forecasts. Back in 1995 the best wireless prices were 50 cents per minute and just for buying a lot of local access. Long-distance and roaming charges applied. So a corporate executive who travelled a lot would regularly rack up $2000-3000 monthly phone bills. The result was less than 10% penetration, 80 minutes of use per month, and ARPUs declining from $45 to $40 to $35 in analysts' models because the marginal customers being added to the network were using the devices infrequently and more often than not putting them into the glove compartment in case of emergencies. Fewer than 3% of the population actually used the devices more than 1x day. We used to poll taxi drivers continuously about wireless and found that their average perceived price of $0.75 per minute was simply too high to justify not having to pull over and use a payphone for $0.25. So that was the magical inflection point in the elasticity curves. When MicroCell introduced $0.10 late in the Spring of 1996 and we polled the same set of users, invariably we were just able to avoid an accident they got so excited. So we reasoned and modeled that more than just taxi drivers would use wireless as a primary access device. And use it a lot. This wireless/wireline substitution would result in consumption of 700-800 minutes of use per month, penetration hitting 100% quickly and ARPUs, rather than declining, actually increasing to $70. The forecast was unbelievably bullish. And of course no one believed it in 1996, even though all those numbers were mostly reached within 5 years. But we also recognized that wireless was a two-edge sword with respect to localized capacity and throughput; taking into account the above 3 laws. So we also created an optimal zone, or location-based, pricing and selling plan that increased ARPUs and effective yield and were vastly superior to all you can eat (AYCE) and eat what you want (EWYW) plans. Unfortunately, carriers didn't understand or appreciate M. Zipf and within 2 years they were giving away night and weekend minutes for free, where they could have monetized them for 3-6 cents each. Then some carriers responded by giving away long-distance (whose marginal cost was less than a minutes without access; but still could cost 2-3 cents). Then AT&T responded with the One-rate plan, which destroyed roaming surcharges and led to one-rate everywhere; even if demand was different everywhere. Here’s a snapshot of that analysis that is quite simple and consistent with Zipf's law and highly applicable today. Unfortunately, where my approach would have kept effective yield at 8 cents or higher, the competitive carriers responded by going to all you can eat (AYCE) plans and the effective yield dropped to 4 cents by 2004. Had intercarrier SMS not occurred in the 2003-4 timeframe, they would have all been sunk with those pricing models, as they were in the middle of massive 2G investment programs for the coming "wireless data explosion", which actually didn't happen until 3G and smartphones in the 2008-2009 timeframes. It was still a voice and blackberry (texting and email) world in 2007 when the iPhone hit. With ubiquitous SMS and people's preference to text instead of leaving vmail, minutes dropped from 700 to 500, lowering carrier's costs, and they were able to generate incremental revenues on SMS pricing plans (called data) in the 2004-2007 timeframe. All that said, the analysis and approach is even more useful today since extreme consumption of data will tend to occur disproportionately in the fixed mode (what many refer to as offload). I let you come up with your own solutions. À bientôt! Oh, and look up Free in France to get an idea of where things are headed. What is it about these French? Must be something about Liberté, égalité, fraternité. 67 million Americans live in rural areas. The FCC says the benchmark broadband speed is at least 4 Mbps downstream and 1 Mbps upstream. 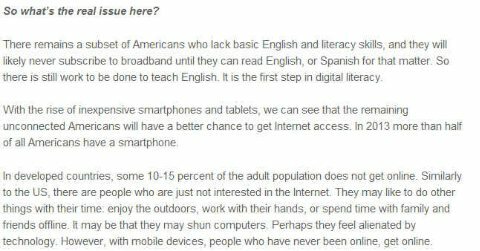 Based on that definition 65% of Americans actually have broadband, but only 50% who live in rural markets do; or 35 million. 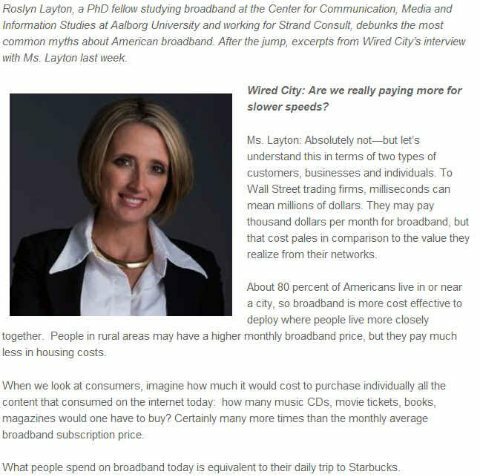 The 50% is due largely because 19 million Americans (28%) who live in rural markets do not even have access to these speeds. Another way of looking at the numbers shows that 97% of non-rural Americans have access to these speeds versus 72% living in rural areas. Rural Americans are at a significant disadvantage to other Americans when it comes to working from home, e-commerce or distance education. Clearly 70% are buying if they have access to it. Furthermore we would argue the FCC standard is no longer acceptable when it comes to basic or high-definition multimedia, video and file downloads. These applications require 10+ Mbps downstream and 3+ Mbps upstream to make applications user friendly. Without those speeds you get what we call the "world-wide-wait" in rural markets for most of today's high-bandwidth applications. In the accompanying 2 figures we see a clear gap between the blue lines (urban) and green lines (rural) for both download and upload speeds. The result is that only 7% of rural Americans use broadband service with 6+/1.5+ Mbps versus 22% nationwide today. The problem in rural markets is lack of alternative and affordable service providers. In fact the NTIA estimates that 4% of Americans have no broadband provider to begin with, 12% only 1 service provider and 44% just 2 providers. Almost all rural subscribers fall into 1 of these 3 categories. Rural utilities, municipalities, businesses and consumers would benefit dramatically from alternative access providers as economic growth is directly tied to broadband penetration. 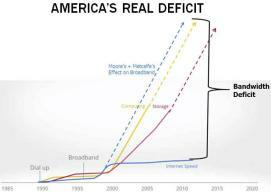 The accompanying chart shows how vital broadband is to regional economic growth. If alternative access drives rural broadband adoption to levels similar to urban markets, then local economies will grow an additional 3% annually. That's because new wireless technology and applications such as home energy management, video on demand, video conferencing and distance learning provide the economic justification for alternative, lower-cost, higher bandwidth solutions. Even though the US has the most reliable electric system in the world, utility companies are not schooled in real-time or two-way concepts when it comes to gathering and reporting data, nor when it comes to customer service. All of that changes with a “smart-grid” and may be the best explanation why so many smart-grid solutions stop at the meter and do not extend fully into the customer premise. Unfortunately, utilities are not prepared to “get” so much information, let alone “give” much to the customer. Over 20 million smart meters, representing 15% penetration in residential markets, have been deployed as of June, 2011 according to IEE. They forecast 65 million (50%) by 2015, at an average cost of $150-250 per household. While these numbers are significant, it will have taken 15 years to get there and even then only 6 million premises, less than 5% of the market, are expected to have energy management devices by 2015. So while the utilities will have a slightly better view of things and have greater controls and operating efficiencies, the consumer will not be engaged fully, if at all. This is the challenge of the smart-grid today. Part of the issue is incumbent organizations--regulatory bodies, large utilities and vendors--and their desire to stick to proven approaches, while not all agreeing on what those approaches are. According to NIST, there are no fewer than 75 key standards and 11 different standards bodies and associations involved in smart-grid research and trials. The result is numerous different approaches, many of which are proprietary and expensive. As well, the industry breaks energy management within smart-grid into 2 broad categories, namely Demand Response Management (DRM or the side the utility controls) and Demand Side Management (DSM or the side the customer arguably controls), instead of just calling it “end-to-end energy management;” which is how we refer to it. Another challenge, specifically for rural utilities is that over 60% have PLC meters, which don’t work with most of the “standard” DRM solutions in the market, necessitating an upgrade. This could actually present an opportunity for a well designed end-to-end solution that leapfrogs the current industry debate and offers a new approach. Such an approach would work-around an expensive investment upgrade of the meter AND allow DSM at the same time. After working with utilities for over 10 years, we’ve discovered that rural utilities are the most receptive to this new way of thinking, not least because they are owned by their customers and they can achieve greater operating efficiencies from end-to-end “smart” technology investment because of their widely dispersed customer base. Ultimately the market will need low-cost, flexible end-to-end solutions to make the smart-grid pervasive and generate the expected ROI for utility and customer alike.